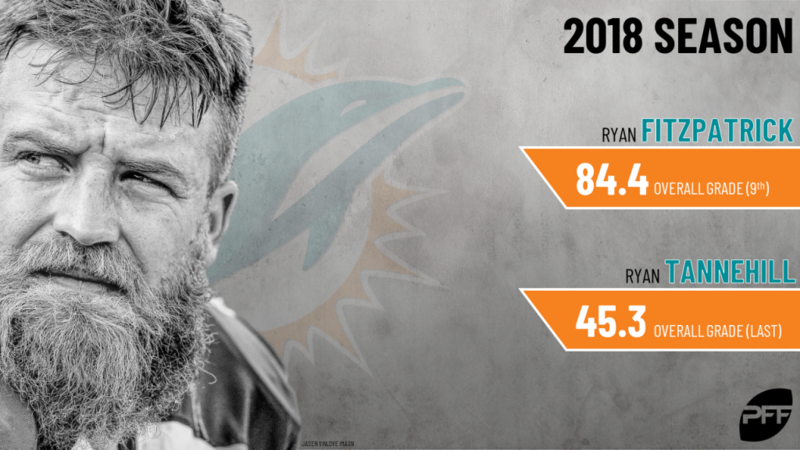 After filling in admirably for the suspended Jameis Winston and then splitting time with him once he returned, Ryan Fitzpatrick earned himself a two-year, 11-million-dollar contract with the quarterback-deficient Miami Dolphins. After trading Ryan Tannehill to the Tennessee Titans earlier in free agency, the only two quarterbacks left on the Dolphins’ roster were Jake Rudock and Luke Falk, who have combined for just ten regular season offensive snaps, so Fitzpatrick will now step in as the clear-cut starter and based on last season; he provides a significant upgrade over Tannehill. Fitzpatrick came out of the gates firing in 2018; over his first two games, he recorded single-game grades of 96.1 in Week 1 and 96.3 in Week 2. The only other quarterbacks to record single-game grades of 96.0 or higher for the entirety of the regular season were Jared Goff in Week 4 (96.3) and Russell Wilson in Week 8 (98.0). Though he remained the starter once Winston returned from suspension, the leash was short, and a 38.9 grade across 28 snaps in Week 4 got him pulled. Fitzpatrick returned in relief to lead a valiant comeback in Week 8 that fell just short to the Cincinnati Bengals, but it did earn him three more starts. In total, Fitzpatrick ended the season with an 84.4 overall grade – the ninth-highest grade among 35 quarterbacks to play at least 400 offensive snaps. Tannehill, on the other hand, did not impress last year. His 45.3 overall grade ranked dead last among qualifying quarterbacks, and he was a prime example of a situation where surface statistics do not tell the whole story. Among 33 quarterbacks with at least 250 dropbacks, his 92.7 passer rating ranks 20th. That’s not outstanding, but it still does not align with his overall grade that was easily the worst in the NFL. The reason? He got help from his receivers on routine throws. For instance, Tannehill went 42-of-46 for 347 yards, and four touchdowns on screen passes — in most cases a routine pass near the line of scrimmage — and his passer rating of 127.1 on such throws led all quarterbacks with at least 25 screen attempts. If you look at his big-time throw to turnover-worthy play ratio, it becomes clear just how poorly he performed. In 318 dropbacks, Tannehill threw 17 touchdowns compared to nine interceptions. However, he had only eight big-time throws – accurate passes deep downfield or into tight windows – compared to 18 turnover-worthy plays. Fitzpatrick threw for over twice the number of big-time throws (20) on fewer attempts, while also not racking up as many turnover-worthy plays (15). Fitzpatrick was especially effective in pushing the ball downfield, an area that Tannehill struggled. Among 33 quarterbacks with at least 25 attempts 20 or more yards downfield, Fitzpatrick had the highest yards per attempt by nearly three yards at 19.2 YPA. His passer rating of 107.2 ranked eighth on such throws. Meanwhile, Tannehill picked up just 10.2 yards per attempt (25th) and a 70.8 passer rating (25th). As fans from fellow AFC East teams – the Buffalo Bills and the New York Jets – will tell you, though, Fitzpatrick is volatile. The 84.4 grade he picked up last season was easily the highest of his career, and he earned a grade as low as 51.8 across 764 snaps with the New York Jets in 2016. Tannehill has been quite the opposite. Prior to 2018, he had graded between 68.4 (in his 2012 rookie season) to 80.4 in 2013; a good, consistent, yet unremarkable option at quarterback. Last year, the floor fell out. The Dolphins are heading into what appears to be a clear rebuild situation. According to Over the Cap, the Dolphins are set to have over 100-million-dollars in cap space in 2020, and all signs point to a “tanking” situation of sorts this year. The problem with that is, based on the events of last year, the Dolphins just got better at quarterback. Fitzpatrick is volatile, but he is certainly capable of stringing together wins when Fitzmagic makes an appearance. At any rate, Fitzpatrick brings some excitement into the fold for next year. Enjoy the ride, Miami.